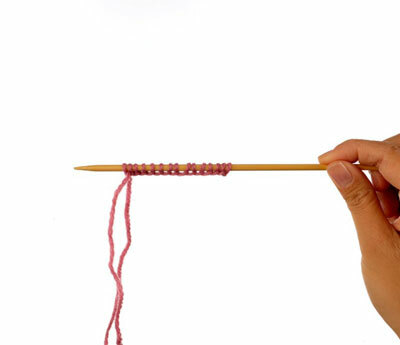 The long-tail cast-on is an easy method that results in a firm yet stretchy edge and uses only one of your needles. This cast-on seems to have a lot of steps, but once you get the hang of it, the long-tail cast-on is fast and even. Just make sure you cast on loosely enough, or your sock will be inflexible at the top edge and might not fit over your foot! Locate your cast-on number on the chart below by finding your gauge along the left edge and the size needed along the top edge. Begin by pulling a long tail from the end of the working yarn—the amount depends on the number of stitches that you need to cast on. A good general rule is 1 inch per stitch in worsted weight or DK yarn, more for bulky yarns, and less for finer yarns. For a sock, about one arm’s length should suffice. 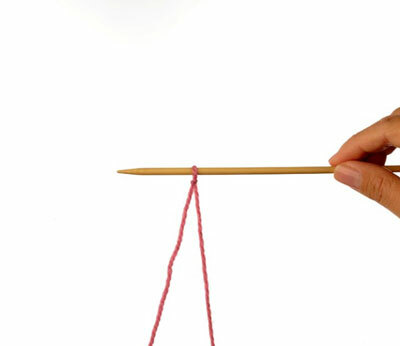 Make a slipknot using the end of the yarn not attached to the ball as the “short” end, and place the slipknot onto a knitting needle. 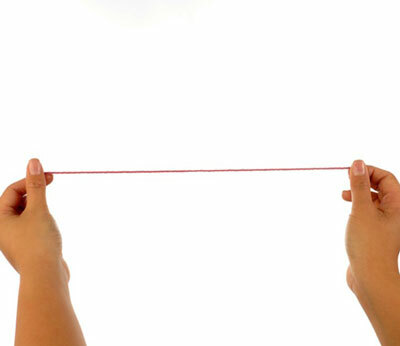 Hold this needle in your right hand, allowing the two tails to hang straight down. Place your left index finger and thumb together and place them between the two tails. 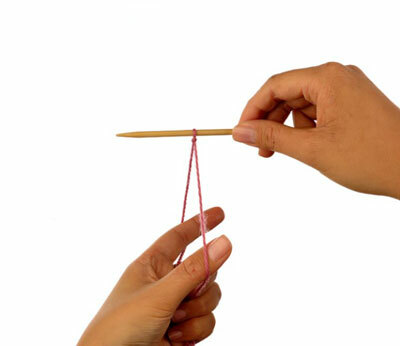 Grasp the two tails together and drop the left hand below the fingers. 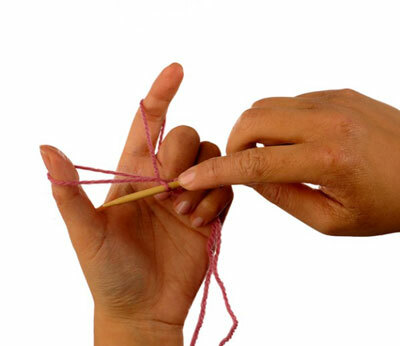 Open the index finger and thumb, separating the two strands of yarn. Bring the needle in your right hand down to the level of the left hand, and rotate the left hand so that the index finger and thumb point upward. This is the starting position of the long-tail cast-on. 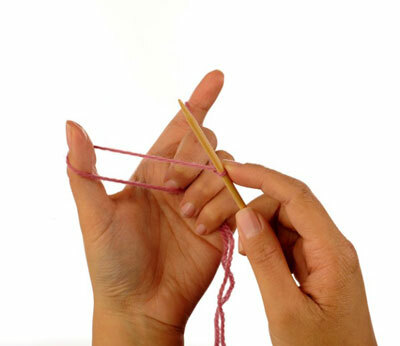 Bring the right needle tip up under the closest strand of yarn (which loops around the thumb). 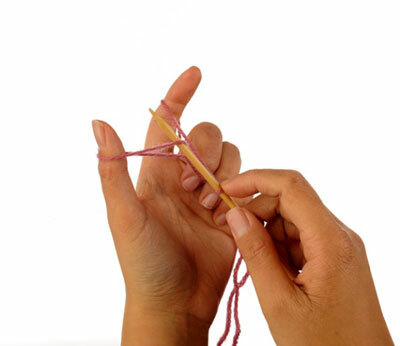 Bring the right needle tip over the farthest strand of yarn (looped around the index finger). Bring the right needle tip along with the farthest strand of yarn through the loop created by the thumb. Drop the loop off the thumb and onto the right needle. One stitch has been cast on. Tighten this stitch on the right needle and return to the starting position. 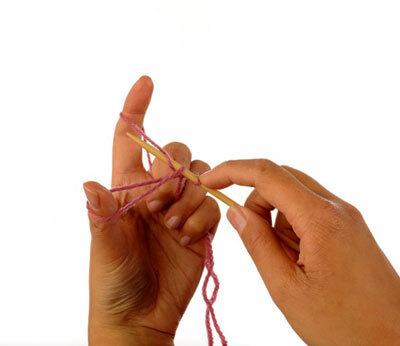 Repeat steps 5–8 until you have cast on the total number of stitches. After you cast on, join for working in the round and place a marker in the work to indicate the beginning of the round.